Cardiff manager Malky Mackay refused to comment on his future at the club before taking charge of the team for Saturday's league match at Liverpool. 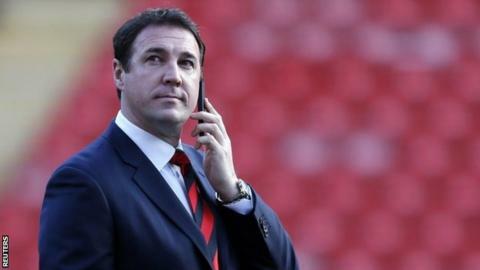 Malaysian owner Vincent Tan, who was at Anfield, told 41-year-old Mackay last Monday to resign or face being sacked. "These are things I will deal with in time," Mackay said, when asked whether he had received an ultimatum from Tan about his future. "Right now, my whole focus is on the game here." Tan flew into London on Friday after being convinced by Bluebirds chairman Mehmet Dalman to hold one final round of negotiations. The Cardiff owner had previously given Dalman the go-ahead to set about appointing Mackay's successor and was deciding whether to sack the Scot before or after the Liverpool game. Dalman has a preferred candidate to replace Mackay - the manager is a high-profile name currently working outside the UK. It is understood he would be keen to join Cardiff, but only if given concrete and binding assurances about his working relationship with Tan. Tan did speak to former Bluebirds boss Dave Jones about a return to the club in some capacity, but he does not intend to follow through with that idea. Jones was replaced by Mackay in June 2011. The owner sent Mackay a letter by email on Monday listing at length his grievances with the 41-year-old and giving him the ultimatum to resign or face being sacked. Their relationship is understood to be beyond repair, but Mackay has stated he will not resign. Assistant manager David Kerslake, rather than Mackay, faced the media at a news conference on Friday to look ahead to Saturday's game against Liverpool and refused to discuss Mackay's position. "All I'm here to do is talk about the Liverpool game," he said. After joining Cardiff in June 2011, Mackay led the team to the League Cup final and Championship play-offs in 2012 before masterminding their promotion to the top flight of English football for the first time since 1962.